Every week I make an effort to bring you free ideas to make and try. This week is something a little different. We all have to spend some money on sewing gadgets for our swing studios. I started thinking about sewing tools this past weekend and which ones I like the best. I have also asked some of my friends which ones they like the best. Sewing enthusiasts seem to be always on the lookout for tools to help them sew more efficiently. I am convinced it is part of the reason we have collections of gadgets in our sewing studios! Or maybe that is just me! Here is the first of my series of Monday Motivation posts about what I think to be the best sewing tools! 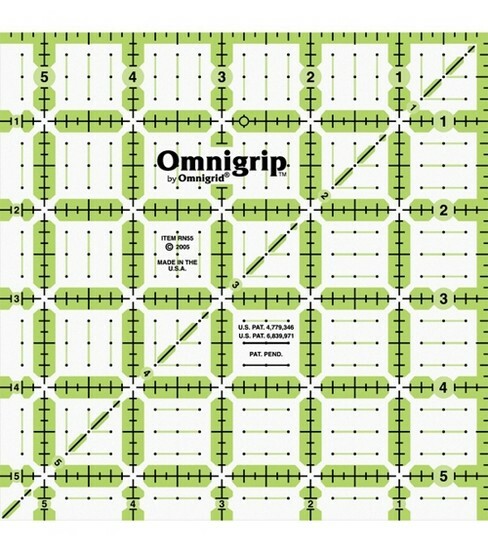 I love the Qmnigrid 5in square ruler! 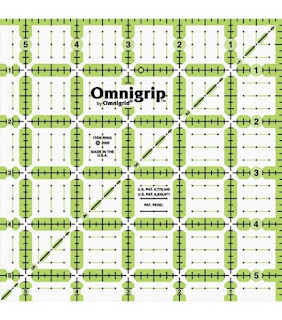 I have been using this for trimming most of my half square triangles. This is a ruler you will reach for time and time again! It is available on Amazon by visiting here. 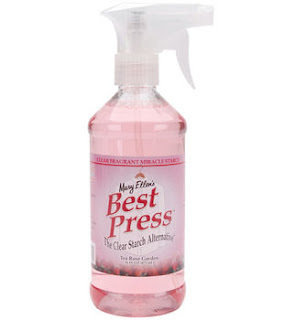 Best Press is a go to favorite for many quilters! The lighter than starch is perfect for helping keep fabrics that are more difficult in place. I love starch and starch alternatives for keeping my blocks from warping too much. "This is a clear starch alternative with soil guard and wrinkle resister. This starch alternative makes ironing easier and more enjoyable with wonderful scents. It is non-flaking even on dark fabrics, non-clogging, acid-free, leaves no residue behind, relaxes stubborn wrinkles, gives clothing a crisp, new finish, makes clothes soil-resistant, does not attract bugs and make fabrics look like new." Joann Fabrics has it on sale and this product can be found here. 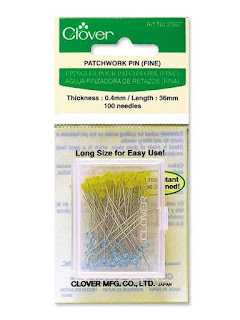 I have tried many hand sewing needles with huge disappointment. Anytime I would bind, my needles would bend and my fingers would end up being very sore. I was introduced to Bohin Needles. I went from using three or four needles to bind a quilt to just one that would still maintain both sharpness and strength. My favorite so far has been the Betweens. Fat Quarter Shop has a few options for Bohin needles here. "It pushes, pokes, pulls, turns and makes it's own uses! 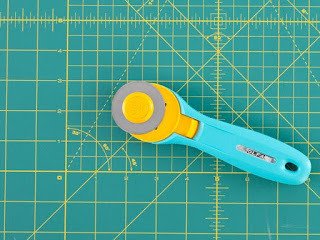 Every accessory maker, seamstress, quilter and crafter absolutely needs this!" Here are just some of the highlights of this amazing tool! "The stiletto point enables you to hold pieces in place easily and is especially helpful when piecing or attaching bindings. 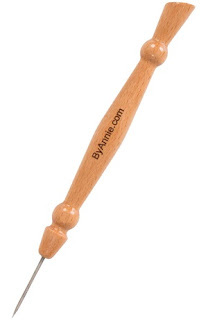 The stiletto/pressing tool is very lightweight so hands don't get tired." There is more information on this item and ordering information on By Annie's here. I have a variety of pins in my possession but, as a quilter, I like the glass headed the best. When I do pin, these do not melt when ironing. I do sometimes forget that I have pins on my blocks especially when there are many ( yikes) so this saves my sanity and my iron! 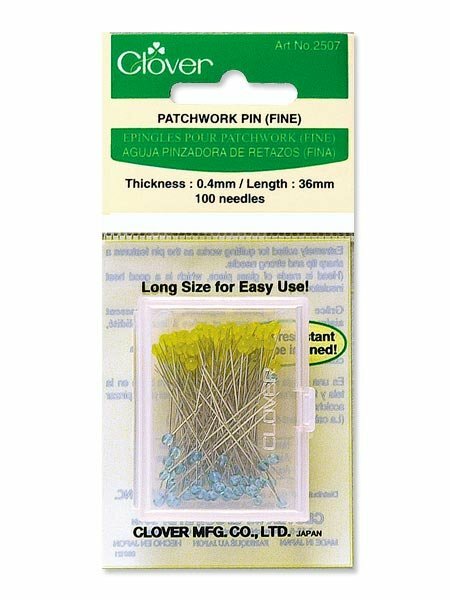 You can find 100 Clover Patchwork glass head pins on sale on Amazon here. 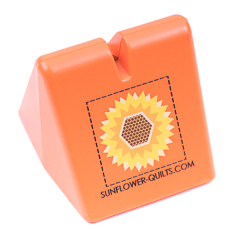 Thread cutting is a task that cannot be avoided so why not make it something to smile about with the The Original Thread Cutter by Sunflower Quilts. "The quickest and easiest way to cut threads while chain piecing. Hold fabric with both hands and slide thread across blade. Thread cutter can be used to cut all types of thread, including yarn, string, and fishing line." You can find this product on Fat Quarter Shop here. 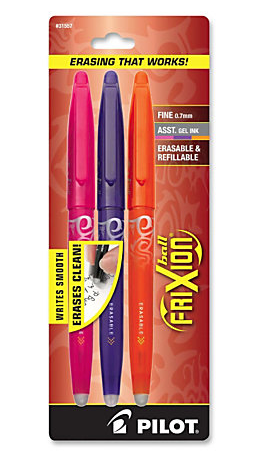 Although FriXion pens have had their controversy in the quilting world, I love them! If you do not use them on very dark fabric ( there can be a light mark left on the fabric see the great post about them on Connecting Threads here), live where the temps are really cold or not making a show quilt, these pens are super helpful for very precision marking and ease of removal. I also LOVE them for embroidery projects! These can be found at almost all local quilt shops ( please support local whenever you can!) and office supply stores. If you cannot find them locally there is a 3 pack at Office Depot here. I am of the opinion that the first lesson to any beginning sewing class is seam ripping. It is the one thing that we ALL have to do, so why not learn how early on! To any sewing project you HAVE to have at least one seam ripper handy! I have been brought to tears when I have had my favorite seam ripper lost. It was later found hiding in a heating duct that is under my sewing table. I think that it was hiding from over use 😉 My favorite one, Jack is a small vintage one that cannot be found any longer. The Seam Fix Seam Ripper by Dritz is nice and sharp, fits nicely in the hand and has an end for literally erasing the threads away! "Make the inevitable job of having to rip seams a little more pleasant with this useful tool. 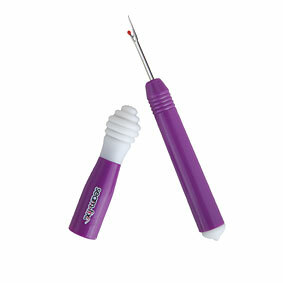 Rip out your seams with the sharp seam ripper, then use the rubber head to catch and remove all of the little threads. The rubber tip will also help to close up needle holes." This great tool is available at many local shops and also at Connecting Threads here. The scissors that I cannot live without are Havel's 5 1/2 Embroidery Scissors. They are very sharp, they do not drag on fabric, they cut with excellent precision when I am working on small piecing ( like my tiny log cabin blocks) and they feel good on my fingers. 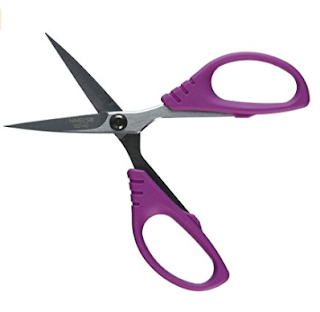 I do not like when the scissor handles get too cold or slip in use. You can find these scissors on sale now at Amazon here. I think I have five rotary cutters. I have tried many and have settled on one that meets all of my needs. It is lightweight, easy to use and BY GOLLY! It is also cute! The Olfa Splash 45mm Rotary Cutter is hands down the easiest rotary cutter for me. Ideal for medium to heavy-weight projects, this razor-sharp blade easily cuts through up to six layers of fabric. Made of high-quality tungsten carbide tool steel, it's sure to deliver precision project after project." This item can be found at your local quilt shop, a big box sewing store or online at Craftsy , on sale now here. These are items to start with, I have more coming in next week's Monday Motivation so I look forward to sharing more with you next week! 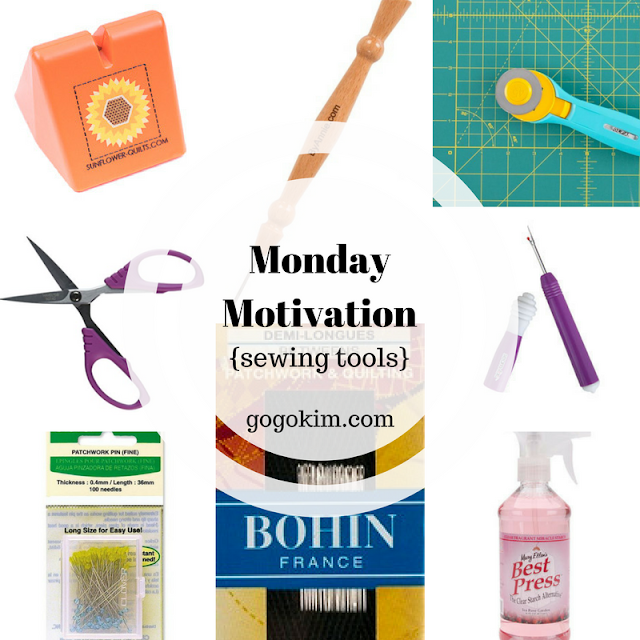 I would also LOVE to hear what sewing item's you cannot live without! Please let me know, I am always looking for new an better ways to sew! Can't live without: Bloc-Loc half square triangle ruler, Havel's curved-blade snips (don't have to insert your fingers into holes), magnetic pin cushion, Omnigrid 4x14 and 6x24 rulers, Steady Betty. Thanks for the suggestions. I actually already have half of these in my arms reach cabinet. :) I have never used a stiletto before though. It has been one of those things that I wonder about using frequently. I know that I really like to hear how other quilters like the tools they try. 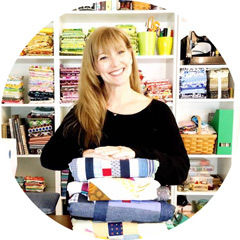 There are so many out there, and it is good to know when something is a favorite of a trusted quilter. 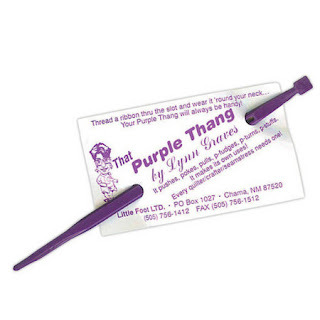 lots of goodies here have the purple thang but must own up to not using it yet. Re the fabric markers dare not try them as my house is so cold, I only heat the kitchen so can imagine all the lines coming back on the quilts.The rubber on the seam ripper is a great idea, picking off all the threads by hand is a pain!